Union tribal affairs minister Jual Oram today said Scheduled Tribe status for 11 Gorkha communities would be realised as assured by Prime Minister Narendra Modi. Speaking at the inauguration of the statue of Swami Vivekananda here today, Oram said a committee headed by Askok Pai, the joint secretary in the tribal affairs department, was looking into the matter and would submit its recommendation. "The case of the 11 Gorkha communities is a stage ahead of the 1000 other applications of various communities (seeking ST status)...This will definitely be realised....Prime Minister Narendra Bhai Modi has given his words and assurance. Unlike other prime ministers, the words and assurance of Narendra Bhai Modi are different. That is why we will definitely succeed," he said. In April, the Union tribal affairs ministry had set up a committee under joint secretary Pai to examine granting ST status to the 11 communities. According to existing norms, ST status is granted to a community after Parliament clears a bill amending the list of STs. While the Centre moves the bill in Parliament, the initiative has to be taken by the respective state government that has to recommend specific communities for inclusion. The tribal affairs ministry seeks the opinion of the Registrar General of India and the National Commission for STs, after which the bill is taken to Parliament. Mamata Banerjee government had already sent a note to the Centre in February, 2014, recommending tribal tag to the 11 Gorkha communities. The Gorkha Janmukti Morcha that has been at the forefront of a campaign for the tribal status for the 11 communities has welcomed Oram's statement. "The Pai committee is studying the matter and we expect him to come up with the recommendation. The delay in submitting the report is due to a death in Pai's family. 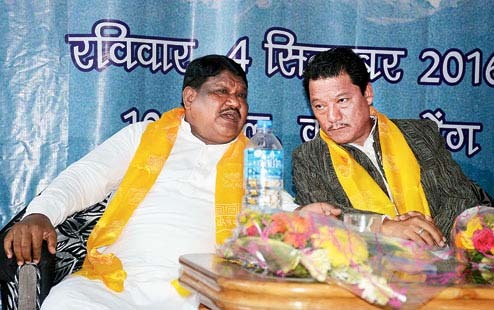 We remain confident that our demand will be met," Morcha secretary Roshan Giri said on the sidelines of the event.